Punjab is the most culturally rich region of India, where you can get a scoop of what Sikhism looks like. The culture of Punjab is almost synonymous to Sikhism due to the dominant presence of Sikhs in the state. In fact, the Sikh warrior group, Khalsa, was born here at Punjab. Have delicious lassi, watch a bhangra performance or buy classic Punjabi juttis when you're at Punjab. To do the following, visit these 5 best places in Punjab that will take you through all the important points of interest in this glorious state. 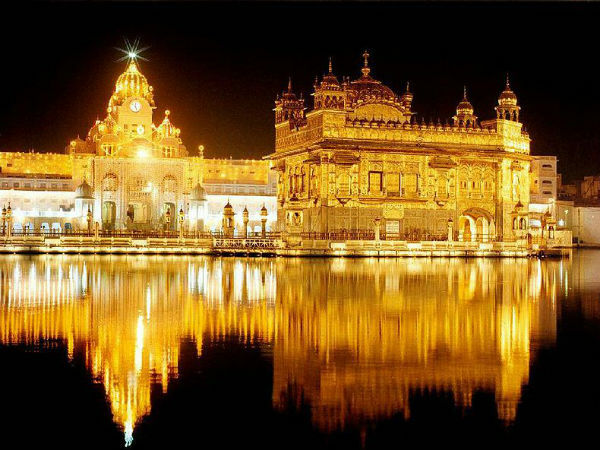 Popular worldwide for Harmandir Sahib, or what is commonly known as the Golden Temple, Amritsar is Punjab's most visited tourist place. Thousands of pilgrims gather at the Golden Temple, since it is the most revered pilgrim spot for Sikhs all across the world. Some of the other popular places of Amritsar that one has to visit on a tour to this glorious city include Jallianwala Bagh, Maharaja Ranjit Singh Museum, Guru Ke Mahal, to name a few. Shop at the popular Hall Bazaar for classic Punjabi clothing and accessories. Being the birthplace of the Sikh warrior group, Khalsa, Anandpur Sahib is another revered destination to visit for Sikhs. The town is located 193 km away from Amritsar and is home to several intriguing tourist attractions. Virasat-e-Khalsa is one such attraction that is a museum that has a collection of information, exhibitions and more about Sikh heritage. This is a one of a kind museum that blends modern art with heritage of the past. Attend Holla Mohalla and Vaisakhi festivals that fall in the months of March and April respectively. These two festivals are celebrated with utmost grandeur at Anandpur Sahib every year. A well-planned city that was built and designed in the hands of Le Corbusier and our former PM Jawaharlal Nehru, Chandigarh is a beautiful city that is the capital of both Punjab as well as Haryana. Chandigarh has some of the most well-planned entertainment centres, like the Leisure Valley, and is spread with myriad of gardens. Sukhna Lake, Rose Garden, Fun City and Terraced Garden are some of the places that you have to visit on a tour to Chandigarh. Don't miss out on the extraordinary Rock Garden of Nek Chand that includes sculptures and art made of waste items like plastic, rock, broken porcelain and more. Patiala is famous for the Qila Mubarak, which stands till date as a fantastic palace built in Sikh architecture. The main attraction of Qila Mubarak is the stunning mirror work that is made in the Durbar Hall. You can witness mirrors of all shapes, sizes and colours beautifully decorating the hall. Moti Bagh Palace of Patiala is one of the biggest residences that used to be the residence of the royal family of Patiala up until 1940s. It has now been converted into a museum. Gurudwara Dukh Nivaran Sahib, Maa Kali Devi Mandir and Bahadurgarh Fort are some of the other attractions of Patiala that you must visit. Bathinda is also home to a Qila Mubarak, which is a much more famous monument that gloriously stands as a landmark to the city of Bathinda till date. This historical monument, which is found in the heart of Bathinda, was used to imprison Razia Sultana, the only Delhi Sultanate woman who tried to take charge. Some of the other places to visit in Bathinda include Zoological Garden, Rose Garden, Chetak Park, etc.